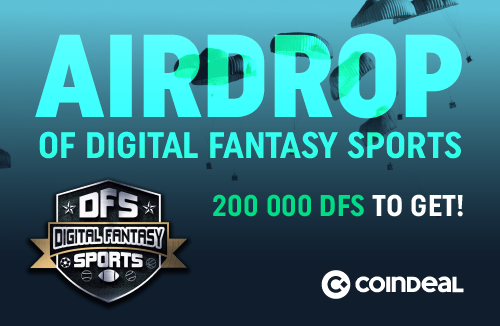 From January 28 to February 11 you can take part in the airdrop organized by CoinDeal and Digital Fantasy Sports. Digital Fantasy Sports (DFS) recently joined our crypto exchange platform. For a good start, we have prepared an airdrop for the CoinDeal community. The total pool is up to 200,000 DFS. - You have to be registered and verified CoinDeal user. - Join CoinDeal and Digital Fantasy Sports community on Telegram. - Follow the @CoinDeal_ and @dfstoken profile on Twitter. - Share the Airdrop post on your Twitter profile. The event runs from January 28, 2019 to February 11, 2019. Funds will be paid out within 14 days of the end of the event - after all participants have been verified. Terms and conditions: CLICK HERE.